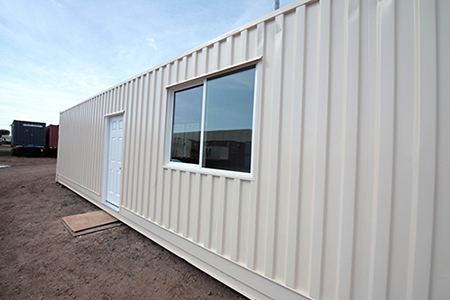 Our custom designed construction office trailers are made from a steel shipping container that we coat properly for a life span that can be 50 years or more with proper care, not 5-7 years as seen with Hawaii Modular’s offices. The roof does not burn out from the sun because our special silicone elastomeric coating does a superior job insulating the suns heat and protecting the steel from rusting. Air conditioning system is 120 volt, not 220 volt, and is simple and economical to operate. Our offices are easy and cost very little to move, and are only 6” above the ground- no stairs, railings or landings needed! Just step up 6” and walk inside! Easy for you and clients. They also do not have a trailer that rusts out. 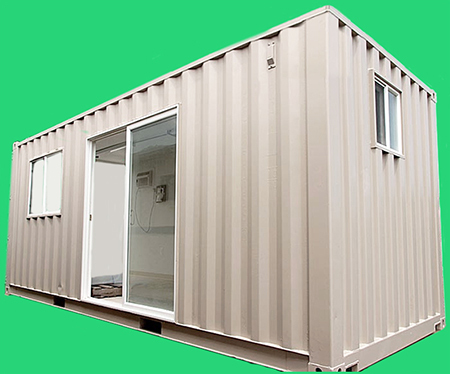 For an amazingly low price, you get our high quality steel container, 36” entry door, sliding vinyl windows, overhead lights, electrical outlets, 120v a/c, interior walls and beautiful acoustic ceiling fully insulated, dry-walled and painted. Click here for a cost and options breakdown. 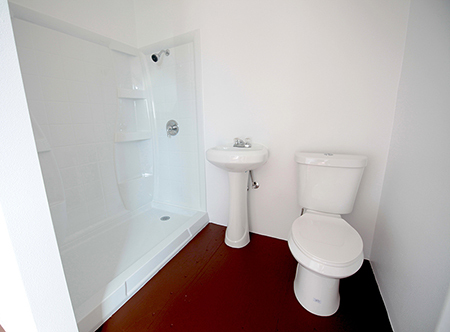 We can install bathroom with or without shower if you have a septic hookup on-site. 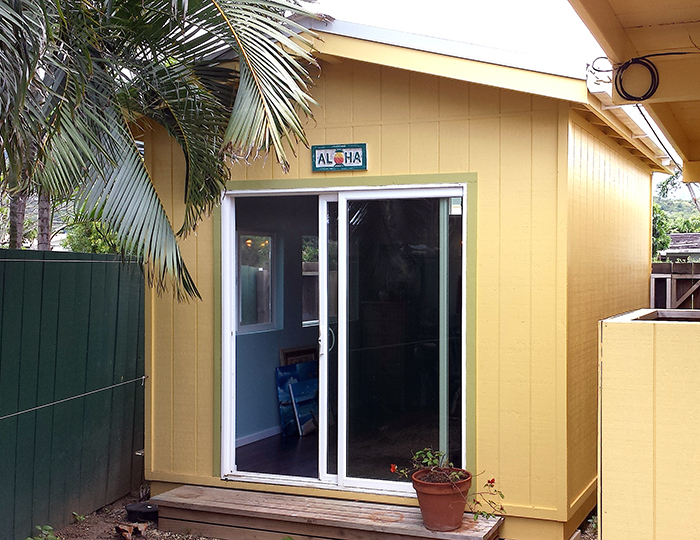 Compare our offices to Hawaii Modular for both price, appearance, cost to set-up and longevity. We think that after your careful comparison, you will understand what we are saying. Call us at 953-2005. Do you need more room inside your mobile office? We can make any length that you might need- 10 - 45’ and totally portable. If you ever need to move your mobile office, we can do that for a very reasonable fee and set it up again. All you really need is an electrician to hook-up the power. You can order your construction office trailer any way you want it- Doors, windows, flooring, insulation and drywall, A/C, lighting, electrical, interior walls with or without doors, special silicone elastomeric protective heat insulating coating, etc . Photos above and left are of a 40’ mobile office showing interior wall, detail of our vinyl sliding window framed in solid steel and detail of our steel 36” exterior door. We strive to maximize the amt of metal used on our offices. 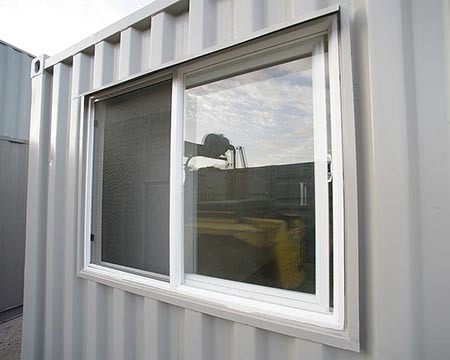 All windows and doors are framed in welded metal, interior walls are built with steel studs. We are happy that at least there is no wood inside the walls where termites could eat away undetected. 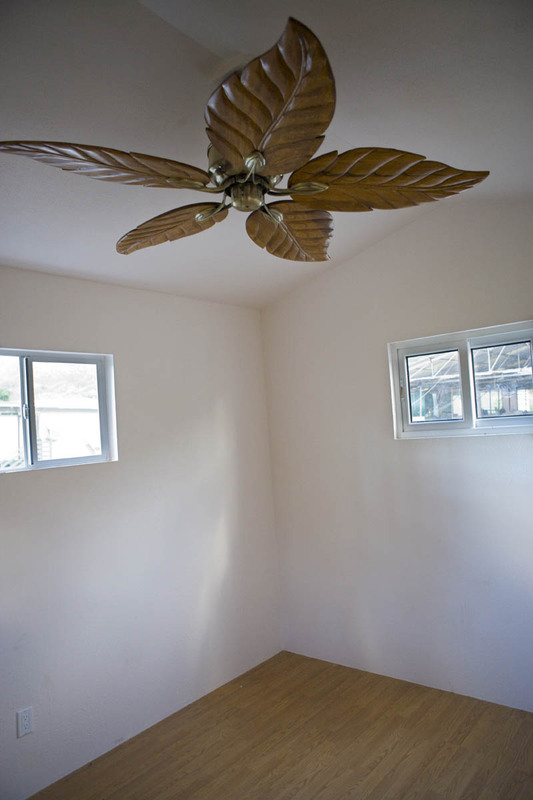 Hawaii Modular offices have well-known serious termite issues. 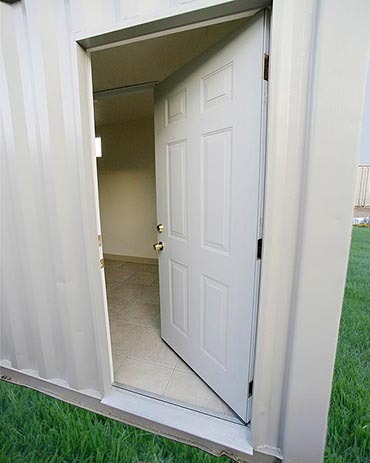 We can, if desired, remove those swinging double doors that come on containers and replace them with straight steel, even frame in a window or door within the new steel wall. 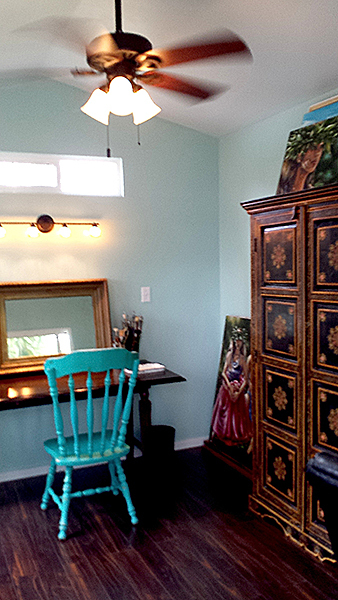 Another cool idea is to have combination secure storage and office space all in one unit! Cost to do this is very low, check out the costs for each modification. Our latest creation- Custom designed “sheds”, offices, spare rooms, guard shacks etc. 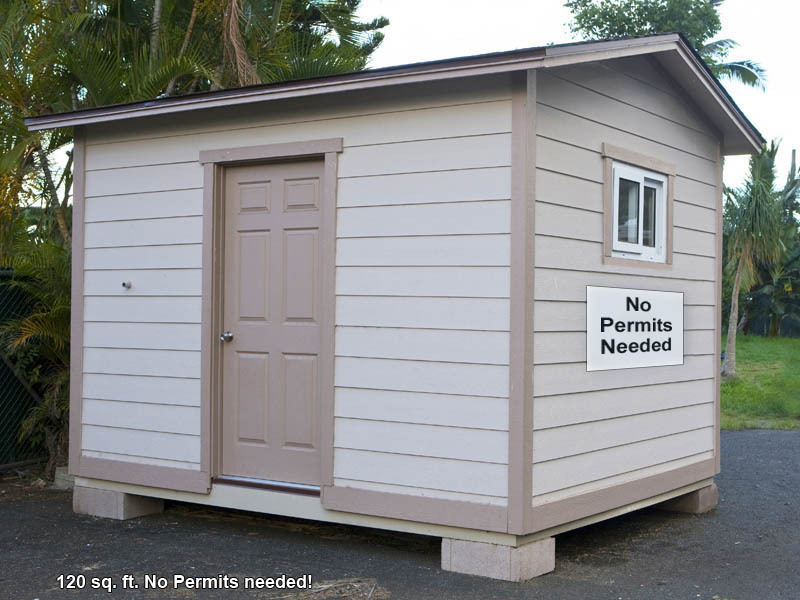 You can build one up to 120 sq ft without a permit, believe it or not! We design it for no charge and build on-site. They look like a cottage and it is like building a home only on a smaller scale. It is quite an involved process. Choose from sliding glass door, french doors or whatever you want. Windows, flooring-whatever! No limitations here, let us know what you want and we will build it. We also design-build permitted structures, but it is more fun creating without the hassle of permitting. Call us for for a no-pressure consultation, or email us with your project ideas. 953-2005. 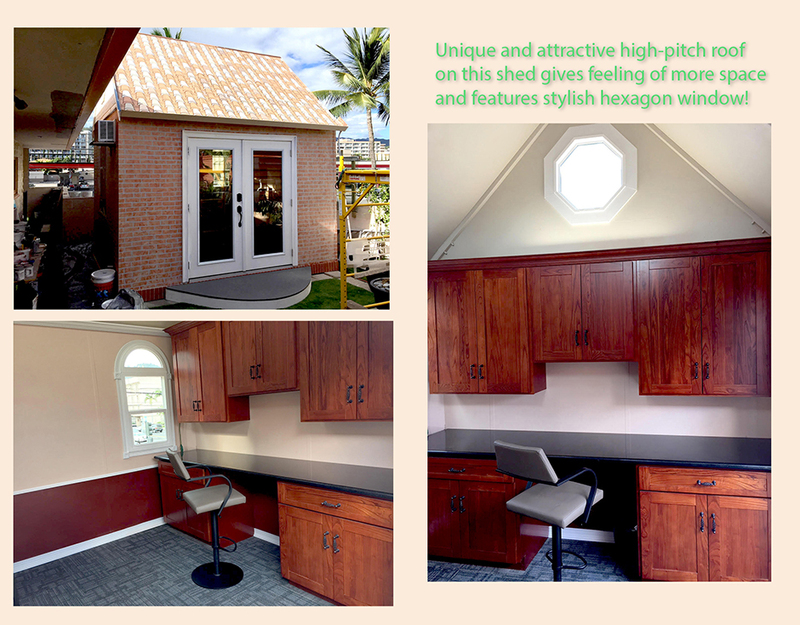 120 sq ft Triangular shaped shed built on-site at Niu Peninsula on Oahu. Very tricky to build the roof on a triangular shaped structure. Owner opted for our suggested OSB siding with smooth cedar texture. 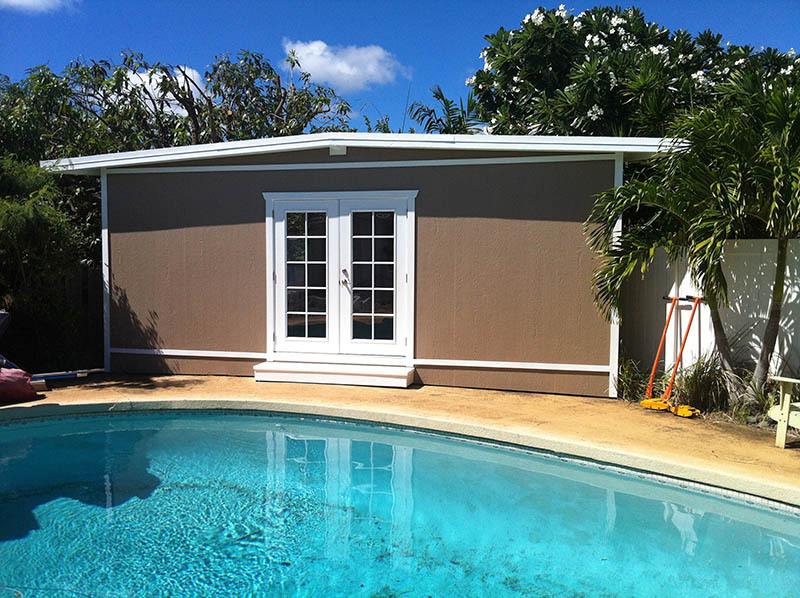 You can see a close up photo of this siding by searching on our site map for "recommended materials".